This plugin simply adds one command for your players; /shop. 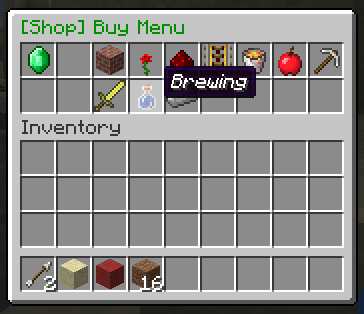 This command will open a clickable GUI with the shop on top and your inventory on the bottom. Simply navigate to the item you want, and click on it to buy or sell it. Please read the whole thread if you can. 1. Easy to use click GUI. 2. Buy or sell any item at a configurable price. 3. Sell enchantments books with any enchantment. 4. Sort item into categories for ease of use. 5. Hooks into vault for economy. description: Gives access to buying menu. description: Gives access to selling menu. description: Gives access to the enchantment menu. description: Gives access to the specified tab. shop.tab. * to give permission for all tabs. description: Gives access to shopping in creative mode. description: Gives access to admin commands like /reloadshop. /shop opens the shop GUI. /reloadshop reload prices and config for the plugin. *working in v1.3. You will also need to install vault and a economy plugin like BOSEconomy or iConomy. There are four configuration files, Options, Tabs, Prices and EnchantmentPrices. SHOP_TITLE will change the prefix of all messages and GUIs made by the shop plugin. This must be under 20 characters long. DONATE_MESSAGE_ON turns the message about donating on. DONATE_MESSAGE lets you set the message that will ask people to donate. ALLOW_BROWSE lets players look through tabs that they do not have permission for, but they can not buy/sell anything in those tabs. PRICE_MULTIPLIER all the prices will be multiplied by this number, good for quickly scaling up the prices to suit your server. Each tab must have a unique ID (tabID=0 in this case). This is used to identify which tab each item goes into. The second part (tabName=Building_Blocks) is to set what this group of items is called, in this example "Building Blocks". Instead of spaces use underscores, '_', in the name of the tab. The last part (IconID=45) is to change the icon of the tab. It is the item ID of the icon, eg 45 is the ID for bricks. You can find the icon IDs of items on minecraft wiki. The first part (WOOD_BIRCH) is not important, just for you to remember what item the configuration is for and it is not interpreted by the plugin at all. The second part (itemID=5:2) is the minecraft ID of an item. You can find these on minecraft wiki or just google it. To get a different version of an item (eg birch wood instead of Oak wood) just add a semicolon (:) and the appropriate data for the alternative version (also available on minecraft wiki). The third and fourth part (buyPrice=4.0 sellPrice=0.5) is the price of a single item, eg one wood. 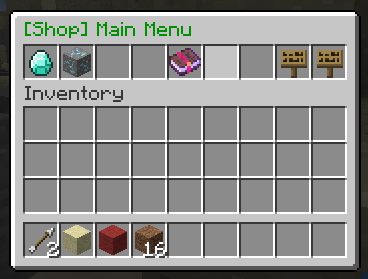 The last part (ItemTAB=0) is which tab (group of items) in the shop GUI the item will appear in. 0 is Building Blocks, 1 is Decorations, 2 is Redstone, 3 is Transportation, 4 is Misc, 5 is Foodstuffs, 6 is Tools, 7 is Combat, 8 is Brewing and 9 is Materials, you can change these in the tabs config. Again the first part (DURABILITY) is just for you; not used by the plugin. The third part is pretty simple, just how strong the enchantment is. This one (enchantmentLevel=3) will get you unbreaking level III. 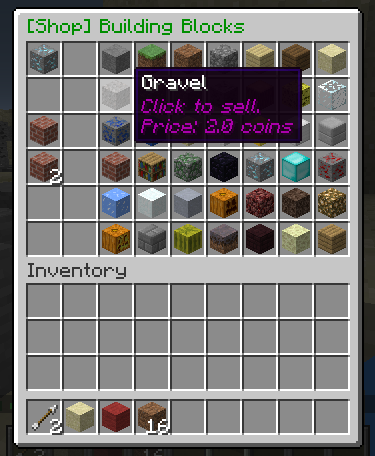 The last bit (enchantmentPrice=10) is simple as well, just the price to buy one enchantment book. Please comment if you use the plugin or would like to make a suggestion. Great plugin! works with my 1.8.9 skyblock server! Hello, I almost have my entire shop set up. I have one question though, how do I make spawners buyable? I have their ID in but it doesn't work. PS love the plugin. Please Fix alot items not showing up in GUI, but plugin is awesome but would be nice that all items from game show up. So I cannot get Nether Quartz, Potatos, Shulker Shells as well as a few items to show in the shop. anyone else having this issue or know how to fix it? Great plugin by a great developer, keep up the good work. Latest download is 100% working with latest version. spawners to the shop I have already tried my self and it has not worked so could someone tell me how to add them?? Although i have a problem myself, the Block Raid etc.. shops DO NOT OPEN any other shop! so no one can actually buy or whatsoever... Is this compatible with 1.10? gbrigando youre doing it rong, you are a newbie arent you? please, before complaining LEARN TO READ because it is really especified up there. and as you donmt even know how to read, how is it posible 4 u to run aserver? Have you tried adding shop.tab. * to your default/ranked groups?